Dry Cider with Sugars and Sweetener. Thirst quenching apple cider. The ultimate in cut-through refreshment. It's the blend of the bittersweet cider apples, grown and pressed in Herefordshire, that gives Strongbow Original its unique thirst quenching taste. The most famous cider on the planet. 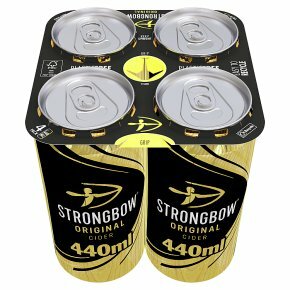 Strongbow's famous refreshment is characterised by its bittersweet, Herefordshire apples - sharp and tangy with lively effervescence and a crisp dryness. ABV: 5.0% Aroma: Crisp and tangy. Flavour: Apple store, cooking apple and oaky. Mouthfeel: Tart green apple. Finish: Crisp and very refreshing. Food Match: Ploughman's, pork belly.